We should be getting a new tool Hasegawa F-35B in 72nd later this year which at least doubles our options on kits and hopefully wont have the raised panels favoured by some manufacturers. after only 9 months of pre-order, but at least it's here now. And 2 packs of Plast brand sheets: Random Stone and Setts; the random stone will work for 1/72 or 1/35, the setts more 1/35 only, but that's what I wanted them for. Nice score Rick. I like the copyright infringement avoiding name. I can see those selling out very quickly. Do they do any other vehicles that might be vaguely connected to a certain movie franchise? A yellow/red/blue XB sedan would be nice with a battered black Monaro to chase. I haven't seen any others from the films, but Scalextric do have the XY GTHO racer in the range. "All bodies listed here are available in 1/24, 1/32, 1/43 and 1/64. Each car is true scale." - meaning not modified/warped to fit an existing standard chassis. www.thepartsbox.com do a number of resin kits of Australian cars in the one true car scale (1/25). And there are a whole heap of die cast Australian cars available in all sorts of scales if that floats your boat (other than collecting certain Hot wheels - who did an XB Hardtop - and 1966 Batmobiles I prefer to build my model cars myself). We have the Bathurst Legends Scalextric set which comes with a Moffat Falcon Hardtop and a Brock Torana. Interestingly the Torana has a stronger magnet on its base making it quicker round the corners but slower on the straights. I bought Mrs z a two car set of 1964 ATCC Minis for xmas. Cool - there's your XB and HQ right there, then - IIRC there were some resin kits of the movie cars a few years ago from Cavalier Models, but I don't know their current status. So Mrs z does 'The Italian Job' then? Cavalier resin kits are out of production and any that turn up on evil-bay are way overpriced. Their XB/XC Hardtop body is undersize and the proportions are not quite right. I had one which had a badly warped chassis. I sold it for what I paid for it. Best bet for building a 1/24 or 1/25 Interceptor is the Aoshima injection kit. Mrs z has a thing for Minis. She has a small collection of Hot Wheels examples, a 1/24 Tamiya I built her and now two 1/32 Scalextric. Yep, the Aoshima is a good kit - I managed to get one of the interim versions a while ago (no stowage or tins) and had fun detailing it up and tweaking things. I think there are a few other resins out there now, but as I don't do Car Scale, I don't keep track. Nothing wrong with a thing for Minis. Arma Hobby Fokker E.V (Junior set). This boxing doesn't have the etch and only 2 sets of markings, but suits me as it's about half the price of the "Expert set"
Not sure if I'll do one of the box options (German and Polish) or a war prize (G.B. or France ?) or maybe one of the Baltic States ? This will be made into a USAF Thunderbirds "prop" and painted and decalled with Thunderbirds stuff. I'm going to line up a ton of it all in 1/72 including what-ifs and real ones alike. So far, in the real stuff, all I have left is a C-123 Provider and the F-16. Only problem with this is the windshield is solid just like the rest of it. No problem!! 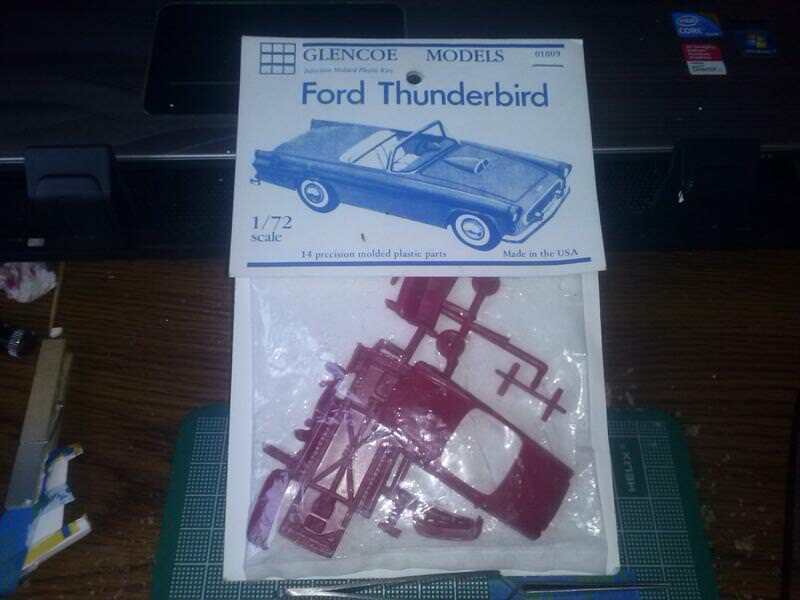 paint/decal the solid windscreen as if it had a folding sunscreen (more T-bird merchandise) displayed. Now there's a grand idea!! I'll definitely give that a whirl and see how it goes. Barring that, I'll paint on a cartoon-like sky blue windshield with white diagonal stripes as "glare." Or something... paint "reflected scenery" maybe. I like your idea better though and sounds neat to try if my skills are up to task. I almost want to start on it immediately because it's "new" to be working on a car for a change! first new stash addition order for this year. -ICM 1/72 Soviet/Russian Air-to-Air ordanance. -ICM 1/144 Ilyushin IL-62M "luftwaffe/Interflug"